Located on the main lobby level of the Four Seasons Singapore, One-Ninety is the hotel’s bistro specializing in the freshest products with a selection of local and international all-time favourites. Classy yet comfortable, the restaurant has an intimate, relaxed atmosphere with delicious cuisine. From Monday to Friday, an appetizer and dessert buffet is offered at lunch, with the option to choose a main course from an à la carte menu that includes a selection of salads, sandwiches, pasta and applewood-grilled meats and fish as well as local dishes. On Saturday, indulge in sweet and savoury local fare at the Mezze lunch. 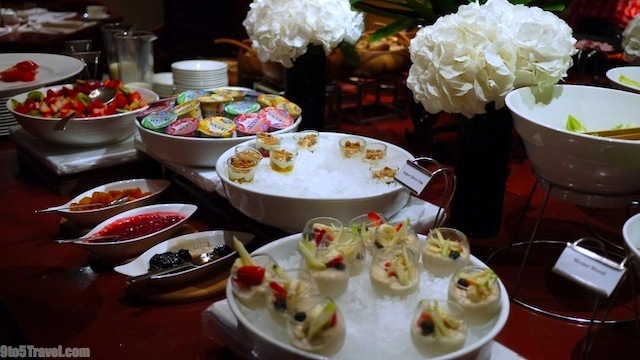 Sunday brunch offers an opportunity to relax and enjoy a feast for the senses – featuring an extensive selection of appetizers as well as buffet stations serving international delights – served with a free flow of champagne or non-alcoholic beverages. During our visit, we were treated to the lavish Breakfast Buffet spread, featuring tantalizing Asian and Western classics. It was an impressive assortment of hot and cold food items, ranging from imported cheeses to fresh tropical fruit to individual birchermüesli to American-style breakfast items to shumai. A table full of homemade (by the hotel’s talented in-house pastry chef) breads and baked goods such as buttery croissants and sweet brioche, were of the highest quality. 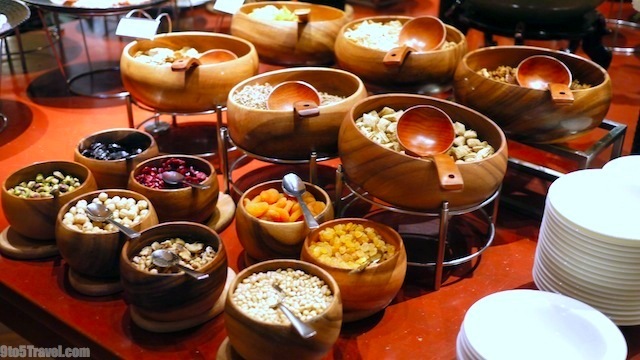 An excellent selection of dried fruit and nuts were provided so guests can customize their own yogurt parfaits. Nice touches included fresh blueberries and raspberries, and multiple varieties of fruit preserves and honey, including rich and complex Manuka Honey. 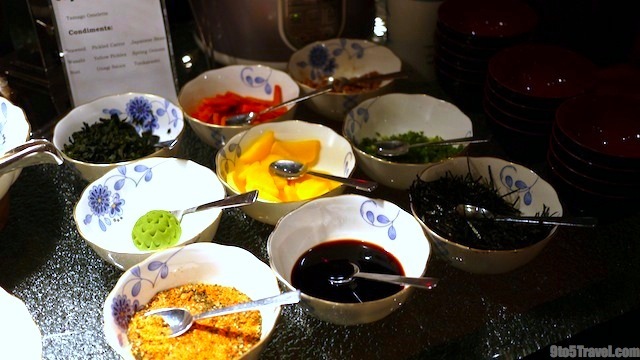 A superb Asian section included breakfast favourites likes Chinese dim sum and congee with an assortment of toppings, and plenty of condiments for savoury Japanese miso soups and udon noodles. 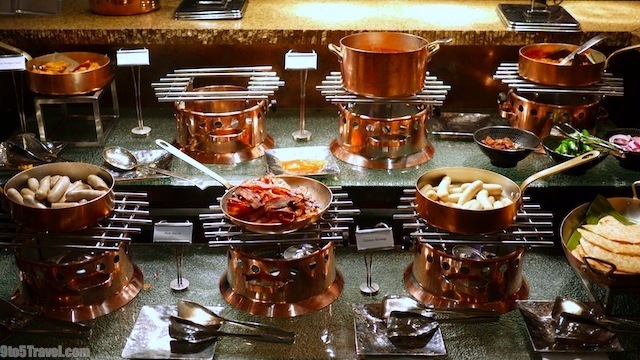 Heated copper pots and pans held Western hot breakfast food favourites such as crispy bacon, English sausages, hashbrowns, and roasted cherry tomatoes infused with aromatic garlic. Right beside these dishes was a station were cooks whipped up eggs and omelets à la minute to guests’ liking. Another table housed a fantastic selection smoked salmon and other fish along with sliced meats. For beverages, coffee, tea and fresh juices were also included with the buffet. Breakfast at One-Ninety was outstanding, and as excepted from a Four Seasons hotel restaurant, service was impeccable. If you’re amongst those with discerning taste, then this exceedingly popular luxe hotel restaurant is sure to please. 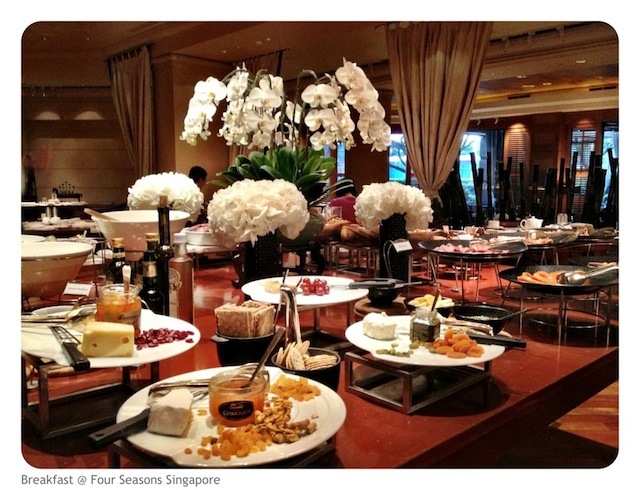 Many thanks to Michelle Wan of the Four Seasons Singapore for our lovely meal! Wedding Goes GANGNAM STYLE at Delta Victoria Ocean Pointe Resort & Spa!